Sometimes I feel as though America is as upside down as this Apple Upside Down Cake. It makes my head spin to think about the fact that NJ Governor Chris Christie has issued an executive order for flags to be flown at half-staff in honor of Whitney Houston. Since her passing away last Saturday, she has overwhelmed the mass media, being the highlight of every news broadcast, on the headlines of every newspaper, and cluttering up Facebook news feeds everywhere. Society is completely abuzz. I have to ask, people, Did Whitney Houston ever loan you 5 bucks? Did she ever let you cry on her shoulder at the end of a bad day? Has she ever wished you a Happy Birthday? Help you change a flat tire while stranded on the side of a road somewhere? Did she ever cook you dinner, lend you an article of clothing, or give you personal advice? If your answer is “no” to each of these questions, then why care so much that she died? Yes, she was talented at what she did, but at the end of the day she was a drug addict who drowned herself in a bathtub. She did not contribute in any way, shape, or form to the betterment of our country, nonetheless the state of New Jersey. Meanwhile, there are HEROES- members of our military, law enforcement, firefighters, volunteers, and government leaders who have devoted their lives to serving and protecting us. They have put their lives on the line day in and day out to keep us safe, defend our freedom, and make positive differences in the lives of others. Some of them have made the ultimate sacrifice…. and they receive what recognition, a 17 second segment on the evening news? I’m sorry, America, today I will NOT be streaming Whitney Houston’s funeral live via my Smartphone. I will probably give my Mom a call, spend time with my family, and play a little fetch with the dog. And as for you, Chris Christie, a half-staff flag should be reserved for true patriots. 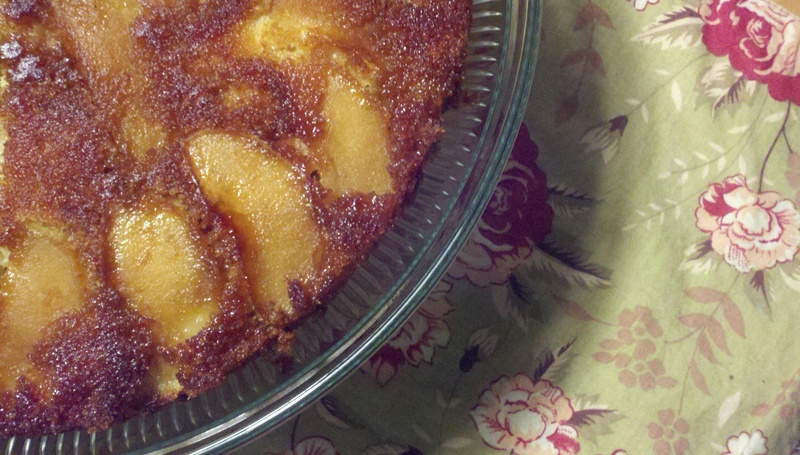 You really are as upside down as this Apple Upside Down Cake. Peel, core, and slice apples into 1/4 inch thick pieces (you could also slice the apple into rings to make it look kinda like a Pineapple Upside Down Cake.) Place the butter, brown sugar, and water in the bottom of a deep 9′ round or 13’x9′ cake pan. Put pan in warm oven just until butter melts and sugar dissolves. Arrange apple slices and nuts in bottom of pan. Prepare cake mix to pkg directions, also incorporating the tsp of cinnamon. Pour batter overtop of apples. Bake at 350 according to pkg recommendations. Once cake is just about cooled, loosen edges with a knife, and invert pan over a plate so cake comes out upside down.